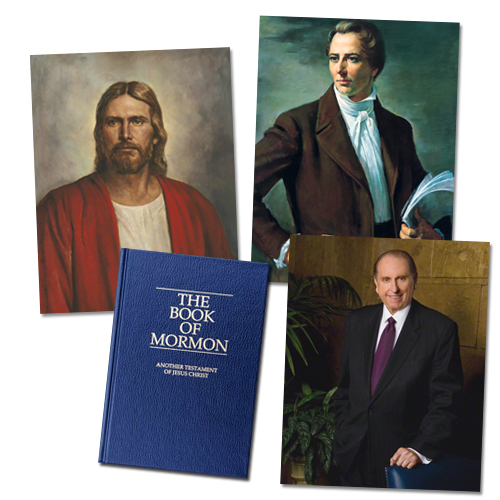 What You'll Need: scriptures, GAK 240: Jesus the Christ, GAK 401: The Prophet Joseph Smith, GAB 137: Thomas S. Monson, scissors, stapler, coloring tools. Scripture: D&C 62:3 - Ye are blessed, for the testimony which ye have borne is recorded in heaven. - Have you seen other kids bearing their testimonies during sacrament meeting? - Why do you think they bear their testimony? A testimony is telling other people what you know is true. Sharing our testimony makes our own testimony stronger and helps others; testimonies to grow to. When we tell people what we know is true the Holy Ghost can whisper to their hearts and tell them what we are saying is true. Missionaries bear their testimonies each and every day...many times! Sometimes we have opportunities to bear our testimonies to others. We can share our testimonies at any time we feel it is right and when we feel the Spirit prompt us. We have a special Sacrament Meeting on one Sunday each month called Fast & Testimony Meeting. This is a time specifically set aside for Ward members to share their testimonies with each other. Sometimes you may hear people make jokes in their testimony. This is not appropriate. It is hard for others to feel the Spirit when we joke. Sometime people cry when they bear their testimony. People cry because they feel so happy and so loved. It's okay to cry when bearing our testimonies. No matter what you bear your testimony about you should always close by saying, In the name of Jesus Christ, Amen. Just the same way you close a prayer. See how easy that was? 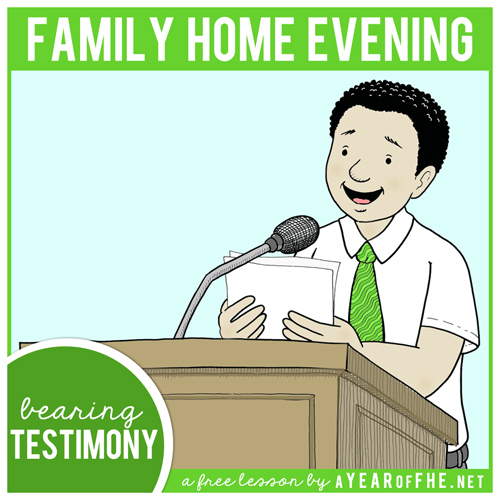 Bearing testimony in front of a lot of people can sometimes be scary. But when you bear your testimony you can feel the Spirit. Remember that the more you share your testimony, the stronger it grows! Bear your testimony about the power of sharing your testimony. If you don't bear your testimony often in church you may make a goal to share it in your next Testimony Meeting. 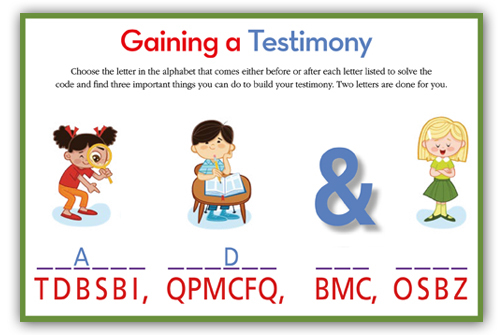 This sets a good example for children, helps them hear your testimony and can help children feel less nervous about sharing their own testimony. If you feel nervous you might share your goal with your family and ask for their support and encouragement. - Have children color pictures. - Cut out each page and staple along edge to form book. 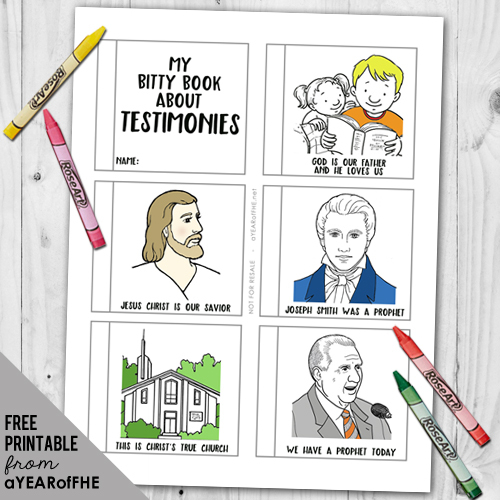 - Children may use book to practice and may take book to next Testimony Meeting to review before bearing their testimony. Have teens and adults in the family read this article and write a Testimony goal in the bottom portion where indicated. Thank you! We are going to do use it tonight! Thank you so much. I love the free printable and the well thought out lessons. My 3 year old loved bearing his testimony last night just like mom and dad :) And every week he gets so excited to color a new picture. Thank you! I am so glad I found your blog! It's just what I need! I like that they are written for younger children. My kids are the same ages as yours. Most of the lessons that I find are geared towards older families. Thanks for sharing! Thank you, we plan on doing this lesson tonight and even practice with a real microphone. The coloring page is perfect. I'm so glad I found this site. I'm not creative enough to come up with fhe's on my own. 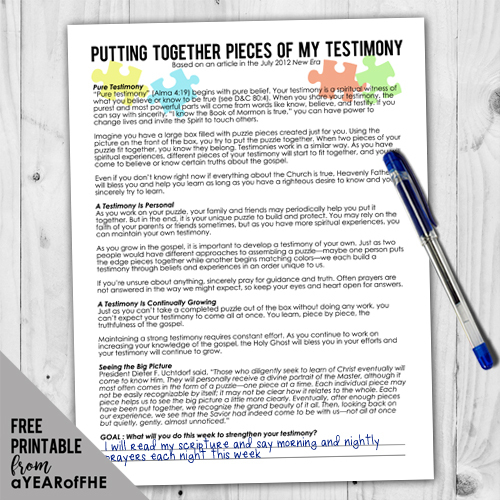 I have been wanting to have an fhe on testimony for my kids so that when they get up to bear their testimonies they know they purpose behind it. Thanks for all your hard work..We Plan to use this tonight and lots of other lessons in the future! I love love love your blog! What a fun FHE lesson! I can't wait to do this with my kids! They will love it! Question: you mention a glove, "Let's practice! (Let each child wear the glove and practice bearing their testimony in front of the family.)" but I don't see mention of it anywhere else. Is there a glove that we are supposed to have?! Thanks! This is a great idea. We are using tonight as well. Thank you! Thank you! Want to use it tonight! Love the book! It's just what I was looking for. The book is perfect for my little kids. Thank you! My daughter requested a lesson on how to bear testimony and this is the perfect level for her to understand it. And the younger kids will love the coloring project at the end. You have the best ideas and lessons! I tried to look on Pinterest but the good ones cost money! Thank you so much! D&C 62:3 is one of my favorite scriptures about testimony. I love your cute printable at the end! I'm excited to do this lesson with my kids. Thanks for all the effort you put into this website and for making your resources available! just found your site! thanks for all your hard work and sharing it with all of us! Thank you so much for all of your amazing hard work! I loved how you incorporated practicing testimonies in this lesson. Thanks for the lesson! The printable book at the end is perfect for my kids! Thanks so much, this is very sweet, I can't wait to share this with my kids tonight!